When making a throw down to 2nd base, your catcher will probably need different footwork on an inside pitch than when she catches an outside pitch. Whenever a catcher receives the ball away from her throwing hand she can’t take time to bring the ball back to her body but instead needs to move her body to the ball. Typically, catchers will use the pivot on an inside pitch and the jump-turn or skateboard footwork when catching an outside pitch. Work with your catchers to practice both. 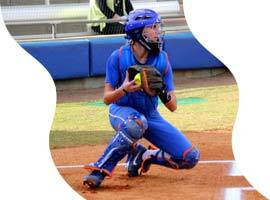 For more on this topic check out The Fundamentals of Catching DVD.